When you’re in the Inland Northwest, you’re close enough to all the modern conveniences of life, yet far enough away to slow down and enjoy them. Lake Coeur d’Alene has been called one of the most beautiful spots on Earth, and attracts tourists from all around the world to it’s beautiful shores to enjoy both summer and winter activities and attractions. The city’s rich timber, mining and logging history blends nicely with the laid back resort atmosphere making the city of Coeur d’Alene an ideal spot to spend a lifetime or two. Downtown Coeur d'Alene on a warm summer afternoon, or on a chilly, decorated December evening is magical! Stroll to the resort for world class dining, enjoy our city beach and park, or take a leisurely walk along the historic shopping district from Government Way to 7th Street on Sherman Ave. The North Idaho panhandle also offers an impressive supply of year-round recreation opportunities for all ages and interests, including skiing, snowmobiling, boating, golfing, hiking and biking, and with 5 quality ski resorts, over 20 golf courses and 50 gorgeous lakes all within short driving distance of downtown Coeur d'Alene, you'll find our area is an outdoor enthusiasts paradise! 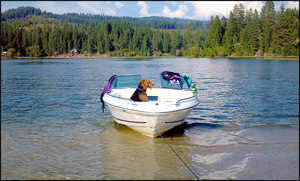 Visit our What to do page for links to some great North Idaho recreational activities. There are so many great things to do in the Spokane Area. It's an area rich in heritage with a population full of community oriented, festive Washingtonians. If you're looking for arts and culture, Spokane is home to the Northwest Museum of Arts and Culture, which explores the region’s history through exhibits on art, culture and Native American heritage. Next door, Tudor-style Campbell House dates from the early 1900s - there's history everywhere you look, especially in the historic downtown area. Site of the 1974 World Expo, the entire Riverfront Park area is home to celebrations all year round. Blessed with a unique combination of outrageous outdoors and amazing attractions, incredible arts and delectable dining, and a historic past living seamlessly with a vibrant future. From thrilling whitewater or downhill adventures, to inspiring art and powerful Broadway performances, the Spokane Region offers enough activities to pack any vacation calendar. Even more central to the heart of the city than the many activities and sites to see is the festive nature of the Lilac city. We're home to some incredible events year round, from the Pig Out in the Park, to Hoopfest, to Bloomsday, it seems like there's always a reason to celebrate in Spokane. No wonder Spokane has been named "All-America City" on multiple occasions. Coeur d'Alene is the home of Ironman Coeur d'Alene, which started in 2003. This Ironman Triathlon is held each year on the fourth Sunday in June and starts at the Coeur d'Alene resort as triathletes start their day with a 2.4-mile (3.9 km) swim in Lake Coeur d'Alene, followed by a 112-mile (180 km) bike, finishing with a 26.2-mile (42.2 km) run. Annually in June, CdA hosts "Car d' Alene," where all the hot cars both new and old, come out to display themselves for admiration and bragging rights. The local college art program had a campaign called "Moose on the Loose," where local artists and college art students painted and decorated a dozen or so life size moose statues with various colors and accessories. After their beautification, they were auctioned off to local businesses as a fundraiser. Their locations range from downtown near Sherman Ave. to Government Way on the CdA/Hayden boundary. The moose have become both a town landmark and a popular scavenger hunt item. Coeur d'Alene has become a destination for golf enthusiasts. The Coeur d'Alene Resort Golf Course is considered one of the best in the United States. Its 14th hole features the world's only movable floating green. The North Idaho Centennial Trail passes through Coeur d'Alene. Coeur d'Alene and the surrounding area also provides many outdoor recreational opportunities, such as: mountain biking, hiking, camping, fishing, hunting, etc. Coeur d'Alene is home of Snake Pit Derby Dames; an all-female flat track roller derby league. The competitive season is March–November and Bouts (matches) draw large crowds. Every year in November, the Friday after Thanksgiving marks the start of Coeur d'Alene's Christmas Lighting Ceremony including a parade, fireworks and special holiday candles given out by the local downtown businesses. Bloomsday Run, a popular race with tens of thousands of runners coming from all around the globe. Lots of fun for novice and experience runners, with a festive atmosphere. Chinese Lantern Festival held in Riverfront Park celebrates Chinese culture with displays, performances, art and great food. Hoopfest, in June, is the largest 3 on 3 basketball tournament in the world. Thousands of teams from all over the world compete. 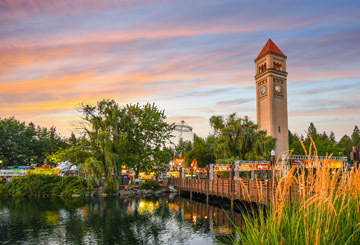 Pig Out in the Park, Lilac Festival, Interstate Fair, Musicfest - the list of fun things to do goes on forever in Spokane!